Until you have a newborn, I don't think you can really appreciate the complexity and logistics involved in taking your baby on an outing. Here's a typical scenario: You feed your baby, she falls asleep on you, you let her doze a bit before you change her, then you get her dressed, get yourself ready, then oh, what do you know...another poopy diaper. So you change your baby again and you have approximately twenty minutes to get to the store and back before your baby needs to eat again. Sigh. It's complicated before you even get to the store. My good friend (a new mom) and I were recently discussing the different methods one can employ once you finally make it to the store. What do you physically do with your infant? She choice to wear her baby in a carrier while she shopped. I think I did that a few times, but my preferred method was popping Nate's infant carrier out of the car seat base and into the Baby Trend Snap N Go Stroller. The big stroller from the stroller systems that most people have (including myself) is just too bulky and heavy for me to take in and out of the trunk one handed. I loved my Sn ap N Go (you may remember that I included it in my post Five Must Haves for the First Year). I would then hang my reusable tote on my Mommy Hook and put any items I was buying in my bag. 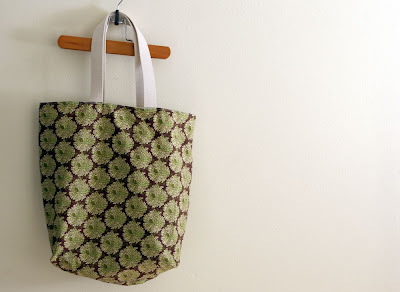 (Which reminds me...have you entered my give away for a Mint Lane market tote and snack bag? You can do that here!) But this method doesn't work if you're buying a lot of heavier items, like diapers. one of my favorite Mint Lane totes! You can also put the infant carrier into the main area of a shopping cart. Diapers and wipes could then go in the bottom of the cart, leaving the top basket part open for small items. I've seen people balance the infant carrier on top of that small part of a shopping cart, but I wouldn't recommend that. While it leaves the majority of the cart open for your purchases, it just doesn't seem safe to me. Shopping is so much easier now that Nate's older and he can sit in the front of the shopping cart! Of course another option for shopping is not leaving your home at all. I'm a huge fan of online shopping. I used Fresh Direct for the majority of my groceries when I lived in Brooklyn. The produce and meat were fresher and the price was about the same as going to your local store. Having groceries delivered definitely beats schlepping heavy bags for ten blocks and then walking up several flights of stairs. Another new mom friend just told me she was going to check out Peapod. I just got a coupon in the mail for $15 off of your first Peapod purchase. I think I'm going to give it a try myself. Has anyone else used Peapod? What did you think? How did you shop with your newborn?